So if you all haven’t already noticed we have recently updated a few things on our blog! We changed the layout and we also got… (DRUM ROLL PLEASE) a LOGO!!! We brainstormed for a while on an idea for our logo. We wanted something that represented our relationship. V and I have always been different but yet very similar. Yin and yang. This is exactly what we wanted our logo to illustrate. Our logo shows two girls (we call them sisters) facing one another. They favor one another but both have a uniqueness about them as well. 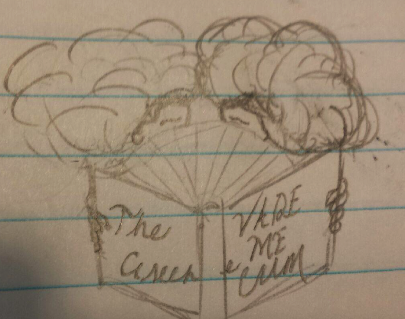 Their hair is in its natural state and they have an open book covering their faces entitled “The Greene Vademecum”. In our video, “Allow us to Introduce Ourselves“, we share the definition of vademecum, “a handbook or guide that is kept constantly at hand for consultation.” We are sisters blogging about aspects and areas of life that inspire us. We hope that our blog can always serve as an outlet and that our positive words and experiences produce thoughtful and positive actions. But We’re JUST Friends …. Is it worth the risk? We love our new logo and feel that it is a perfect representation of our blog and our personal relationship as sisters!